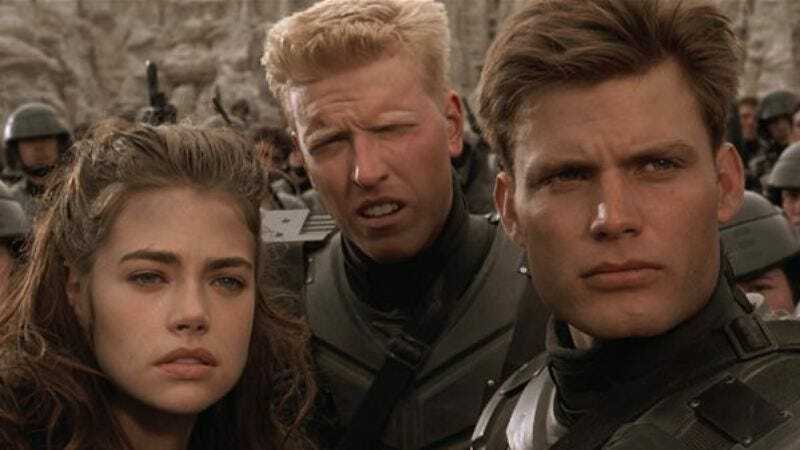 We reported a few years ago that a less-violent, less-satirical, more-patriotic/fascist reboot of Starship Troopers was in the works with producer Toby Jaffe (who worked on the Total Recall reboot) on board. Possibly clued in by the fact that everything about that sounded like a bad idea, the Starship Troopers people are apparently taking a step back and putting a different spin on this whole “Starship Troopers reboot” idea. They’re not necessarily rethinking the “less-satirical” thing, though. They’re just thinking it might work better as a TV show than as a movie. That comes from HitFix, which asked producer Neal H. Moritz about Starship Troopers while he was promoting the upcoming Goosebumps movie. Moritz said that the project is still being developed, but that he and whoever else is involved have “actually been talking about either doing it as a feature or doing it as a television show.” The “actually” there makes it sound like this is a relatively new idea, so we probably won’t be seeing Johnny Rico and the Roughnecks killing bugs on some TV station—by which we mean Syfy, because what other network would want this?—any time soon.